After a 162 game regular season, the play-offs begin tonight. The goal? To win the World Series. The participants? 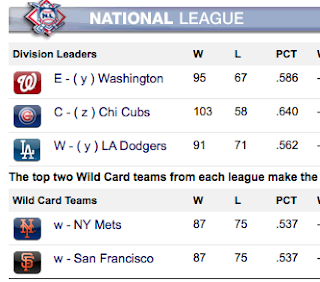 The best 10 teams in baseball--and what a group it is. 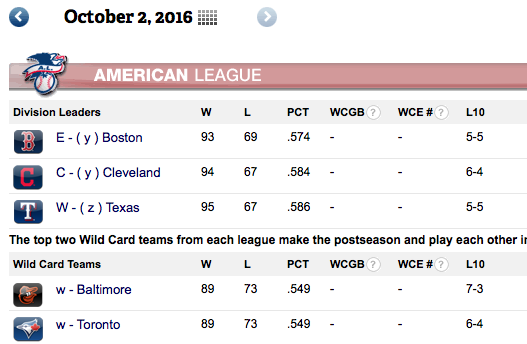 From the American League: Texas, Cleveland, Boston, Toronto, and Baltimore. From the National League: Chicago, Washington, Los Angeles, New York (Mets), and San Francisco. Back in April, when the season was young everyone dreamed of October glory and now the reality is here. Tonight in a one-game play-in the Orioles travel to Toronto for the honor of facing Texas in the Division series. Sadly, the game is not being hosted in Baltimore, although the two teams finished with the same record, the Blue Jays won the season series 10-9 and earned the right to host the Wild Card game. 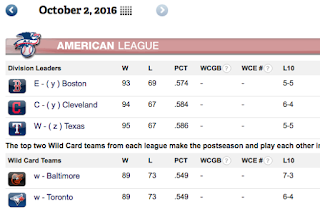 I hope that the Orioles make it to the World Series and form the National League I am cheering for the Washington Nationals. It would be really exciting to have a beltway World Series. The stage is set and I already have tickets for the ALDS play-off games in Baltimore if the Orioles win tonight.